Mondo, Andy and Gretchen. Not a big surprise, although I though Michael C would make it instead of Andy—the green dress saved Andy, I guess. Katydid (yes, she did!) 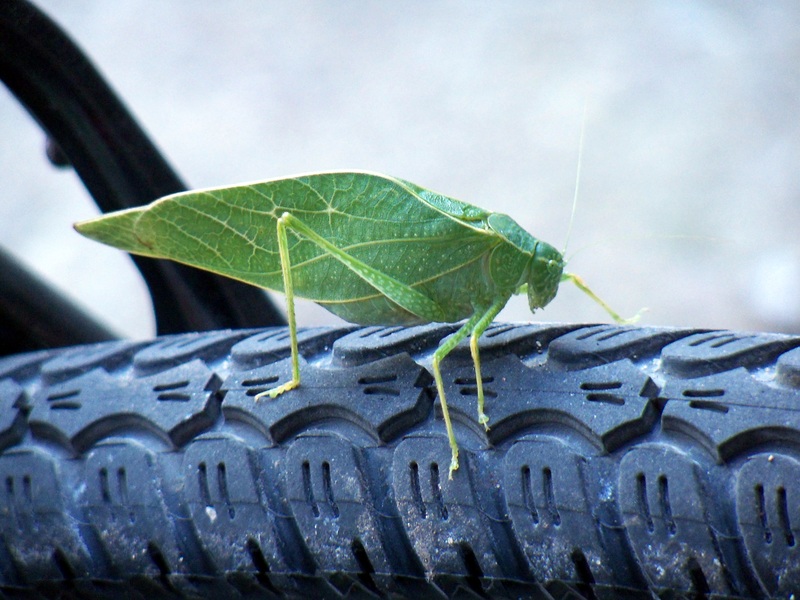 on my bike tire, Sept. 30--oft heard, seldom seen early fall insect. I technically could have continued to shoot for a while, entries were not due until Nov. 1, but I picked three of my fall photos to submit to the Gazette fall contest—the Katydid that landed on my bike tire Sept. 30, a picture of brown oak leaves against a green grass background taken at the MMU Grotto on Oct. 1, and an Oct. 14 picture of a black maple leaf from George Wyth State Park. 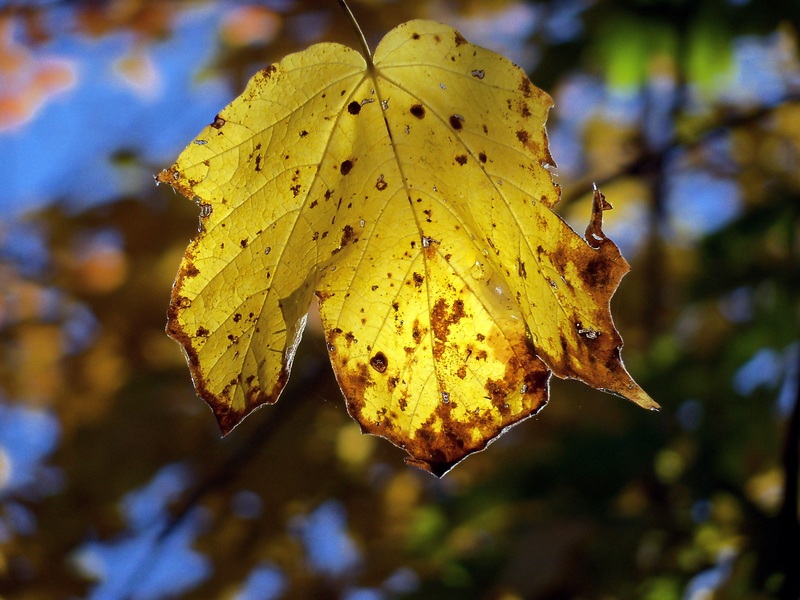 That makes my tulip tree, which is just starting to turn yellow, ineligible this year. Too bad. But, I think I’ll photograph some of its giant tulip-shaped leaves anyway, if I get good weekend weather before the leaves are all gone. 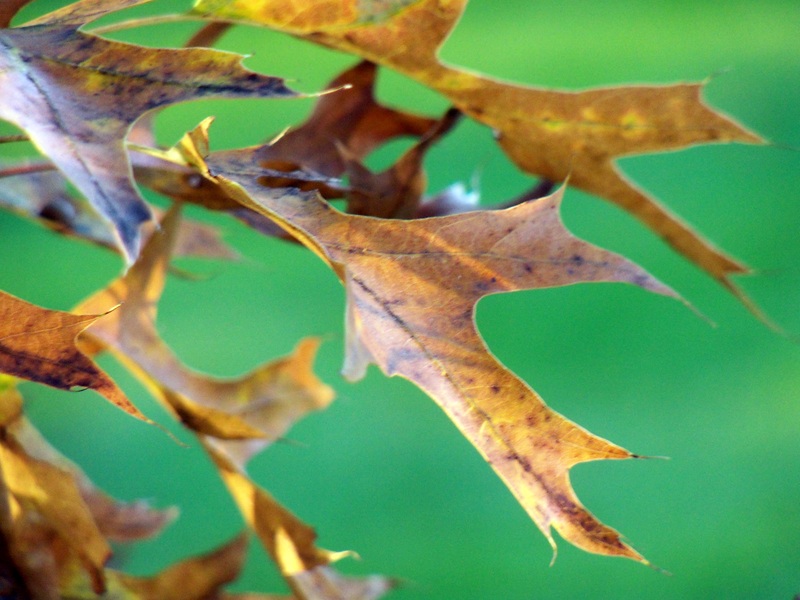 Oak leaves at Mount Mercy Our Lady of Sorrows Grotto, Oct. 1. I like how the leaves are very brown, but the blurred background grass still very green. If I win the Gazette contest? Already promised Audrey a date night meal. If I lose? Well. Not sure I would handle it well, either. I don’t have as much riding on this fall photo contest. It’s not my dream or my future on the line. I am only slightly bummed out that I can only enter three photos–I have several other fall ones that I quite fond of. But, I picked my best three and we’ll see what happens. If I lose, I don’t expect a big meltdown. On the other hand, photo gods of the Gazette, we can always avoid the risk that I won’t handle rejection well … just pick one of my photos as the winner, pretty please! It's either a sugar maple or black maple, but it looks a bit more like a black maple leaf to me. Anyway, maple leaf seen during an Oct. 14 hike at George Wyth State Park, Waterloo. If you want to give me competition, shame on you, but here is a link to the Gazette’s fall “Call of the Colors” photo contest.